ROM the time, only ten years ago, when it was little more than a big wooden box perched precariously between two wheels, the trailer has come a long way. Just recently, an auto-and-trailer unit was traveling the desert road beside the Salton sea, with the speedometer needle hovering close to seventy. As the driver picked up the telephone to inform his family in the trailer that they were nearing their destination, there was a loud bang. The driver felt a quick tug at the steering wheel, a sudden drag on the car. But nothing else happened. There was no loss of control, no careening. Cautiously he set the brakes and brought the two vehicles to a stop. Investigation revealed that one of the trailer tires had blown outâ€”at seventy miles an hour-yet not even a dish was out of place in the trailer’s cupboard. Had this happened in the early days, a serious accident might have followed that blowout. But today’s trailer is built for safety and comfort, carefully engineered to withstand the road hazards likely to be encountered at the high speeds demanded by the modern motorist. Factory-constructed models of the 300,000 rolling homes on American highways boast such features as: Quick-acting hydraulic or electric brakes; channel steel underframes; rugged bodies of oak, elm and airplane spruce; steel-clad plywood walls; spun glass or similar insulation; ball-and-socket couplers that practically eliminate the possibility of the trailer breaking away from the tow car; drop-type windows that disappear into the walls instead of swinging outward at eye level to create a night hazard; cookstoves with steel safety shields and asbestos wings for protection against fire and hot grease; electric refrigerators that freeze ice cubes and retain their low food-preserving temperatures for fourteen to eighteen hours between stops; steel rub rail around the trailer at the lower edge of the body to afford protection from contact with trees; safe space and water heaters ; electric lights; disappearing wash basins; soft, folding beds; screw-type ventilators operated from inside the trailer; screened and storm windows and even collapsible rubber bathtubs. Gasoline consumption, in pulling a trailer, approximates only one mile less per gallon than when the tow car travels alone. One reason for this is that the modern trailer is lightweight. The trailer on which the tire blew out at seventy weighed only 1,100 pounds. Years of experimental building showed engineers that lightweight construction is not only the most economical but also the safest. Most motorists have only to close their eyes to picture yesterday’s box-on-wheels swaying dizzily down the road behind the tow car. Engineers for the Covered Wagon company, a pioneer in this $25,000,000 industry, point out that a trailer acts like a whip lash in going around curves because centrifugal force pushes it around like a boy playing crack-the-whip. In negotiating a curve the trailer tends to pull sideways and to slew the rear end of the tow car toward the out- side of the curve. So today’s rolling home, combining light weight with equal strength, is built a little wider than the automobile, resulting in smooth travel at speeds up to, and sometimes exceeding, a mile a minute. As every motorist knows, light loads are also more easily controlled. Some factories refuse to build trailers heavier than 3,500 pounds and the small-size trailer rarely weighs more than 1,500 pounds. Another important factor is braking. The hydraulic system is operated on both tow car and trailer by the same foot pedal, thus giving pressure on every wheel of the unit. The Warner electric system is controlled by a fingertip lever mounted on the steering post of the tow car. These brakes are installed on the trailer, entirely separate from the tow car’s brakes. Operated in conjunction with the automobile’s brakes, the system affords a powerful, quick-acting means of stopping the two vehicles. In connection with electric brakes, the trailer owner may install a small attachment operated by a flashlight battery to lock the trailer brakes for thirty minutes. Thus, if by any chance the trailer should break away from the tow car, this device would set the brakes automatically and hold the trailer long enough for the owner to stop, back up and reestablish the hitch and electrical connections. Experienced owners recommend the small trailer because it is comfortable, yet lightweight and therefore more easily handled in making or breaking camp. Today, one company is offering a trailer priced below $400, which has adequate cabinet space, plenty of shelves, a wardrobe room, sleeping accommodations for two, kitchenette with sink, ten-gallon water tank and many other features. Seventeen feet long with steel under frame, this trailer has combination six-volt and 110-volt electric-lighting system. It is well sealed against the weather. Compared to the cumbersome trailer of the early days, this model offers real luxury at low cost. Another tip to the trailer owner is not to load down the rolling home with extra equipment. Veteran travelers pride themselves on how little they can get along with. Of course, if the trailer is not already equipped, these items are regarded as essential: Safe braking system; three-burner gasoline cookstove, because the fuel is easy to obtain from filling stations or from the tow car’s tank; small six-volt fan which may be mounted at the roof ventilator to speed up discharge of fumes and cooking odors; fire extinguisher; some safe space heater; adequate sanitary facilities; electrical wiring strong enough to serve all the owner’s needs. 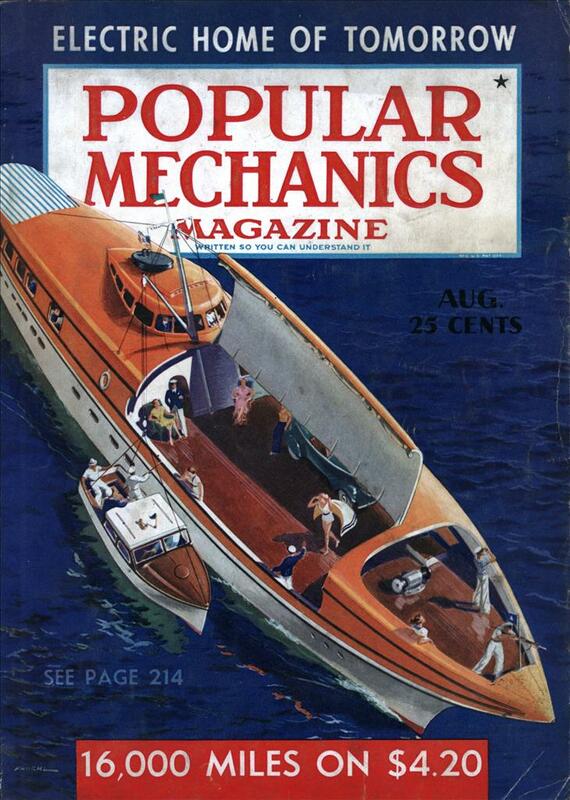 Owners of early-day trailers experienced a lot of trouble with the coupling. Frequently the hitch was unsafe. This hazard has been overcome by the ball-and-socket coupling. The hitch is mounted on the tow car by bolting and welding it to the chassis frame, instead of onto the bumper alone. Covered Wagon engineers employ a railroad type coupler which permits the trailer to be attached easily by backing the tow car into the coupler attachment without the necessity of raising the trailer drawbar above the coupler and then dropping it down on the coupler ball, as is necessary with other types. The coupler is locked to the coupler ball with a throat latch, pins and a safety pin so that it cannot come off, thus making for greater safety. In this connection, an “overload” or auxiliary rear spring is recommended by many engineers for the tow car. This spring does not come into play until the regular spring is depressed to a certain point. Although the trailer may not put an extra heavy load on the car’s rear springs, a passenger or two aft makes a big difference, particularly if riding forward in the trailer. The additional poundage quickly and permanently flattens the spring arch, resulting in rough riding and sometimes in actual damage to the car. Insulation has brought a new degree of comfort and cleanliness to the home on wheels. The latest models are completely insulated, even the floor, wheel-housings and roof ventilator. The insulation supplements an air space between interior paneling and exterior walls. Spun-glass wool, in the form of a continuous blanket backed by a layer of waterproof paper, is used by some builders, being placed in the sidewalls and roof. There is also a half-inch layer of insulation in the floor, a heavy layer of felt over the wheelhousings and a half-inch layer of insulation under the tops of roof ventilators. Thus, the trailer is constructed to keep out heat in summer, cold in winter and dirt and dust in all seasons. With modern fuel-oil heater stoves, it is possible to keep comfortable inside a trailer even in sub-zero weather. Although manufacturers are using insulation plentifully, the trailer purchaser should be careful that the floor be adequately protected with a heavy layer of insulating material beneath. This prevents the cold air flowing beneath the trailer from making the interior uncomfortable in cold weather and saves the space heater from overwork. A well-insulated trailer is easy to heat, and to keep heated. Some owners frown on the use of car-pets and rugs in the trailer, pointing out that they get full of dirt, dust and germs. Linoleum is recommended, principally because it is easy to keep clean, although it is cold on frosty mornings. Water and soap are used on linoleum, with wax being applied afterward. Manufacturers urge owners to try to equalize the load in packing the trailer. Too much load aft will cause the trailer to “fish-tail,” which is annoying and sometimes hazardous, particularly at high speeds. A preponderant weight on the right side will tend to run the trailer down off the crown of the road. Where the highway is bordered by soft dirt shoulders, this is dangerous. Still another recommendation is that the owner have his auto headlights readjusted with the trailer attached. Otherwise, with the rear of the car depressed by the additional weight, the beams will be set at too high an angle for safe driving. An external rear-view mirror, mounted on the car door or fender, is essential for the car-and-trailer unit. While the modern trailer is virtually accidentproof, so far as disastrous results from blowouts are concerned, tiremakers and inventors are going a step farther toward safety. For instance, punctureproof tubes for trailer tires are available. Too, it is possible to mount a steel rim beside the trailer tire so that if a tire blows out, the trailer will travel on the rim and prevent damage to the tire. Lately, another safety device has been introduced. It consists of two prongs extending down beside each trailer tire. If a tire goes flat, the prongs are spread apart, causing an alarm bell to ring in the tow car. About ten years ago, Arthur G. Sherman of Detroit set out with his family on a camping and fishing trip. Behind his car he pulled a tent on a box trailer. He had been told that the tent could be put up in fifteen minutes, with no trouble. Parked beside a lake in northern Michigan, in a driving rainstorm, the Sherman family tried to erect the tent. Fifteen minutes became thirty, then forty-fiveâ€”and still the tent wasn’t up. Exasperated by this experience, Sherman returned home and built a trailer complete with a top that would require no setting up. 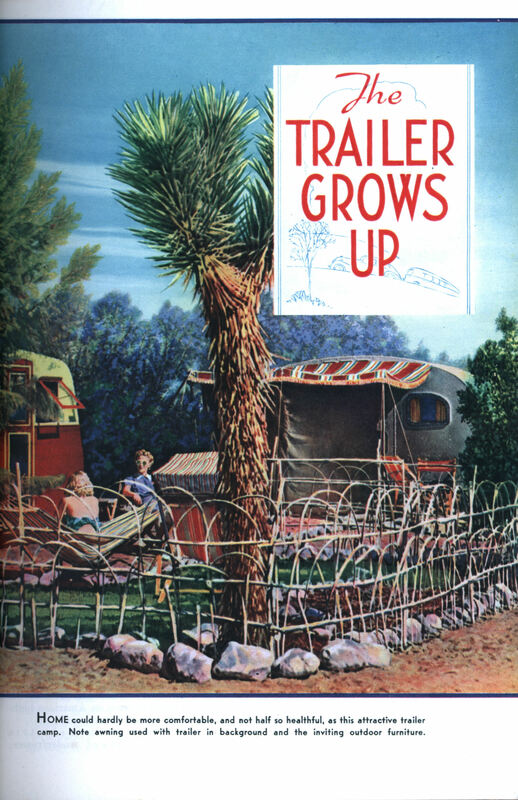 Thus was born the trailer-building industry in America. With the rapid advancement of the trailer in the last ten years has come an almost equal improvement in facilities for the trailerite on the road. Today there are approximately 20,000 trailer parks in the United States. Most of them offer ample space for parking, connections for water, gas and electricity, sanitary facilities, service station for the auto and trailer, a store where supplies may be replenished and perhaps a community center for dancing and other forms of recreation. Any owner contemplating a trip anywhere in the United States may obtain a list of parks approved by the manufacturer of his trailer.